Hello Friends! Are you ready for weekend?! So am I! 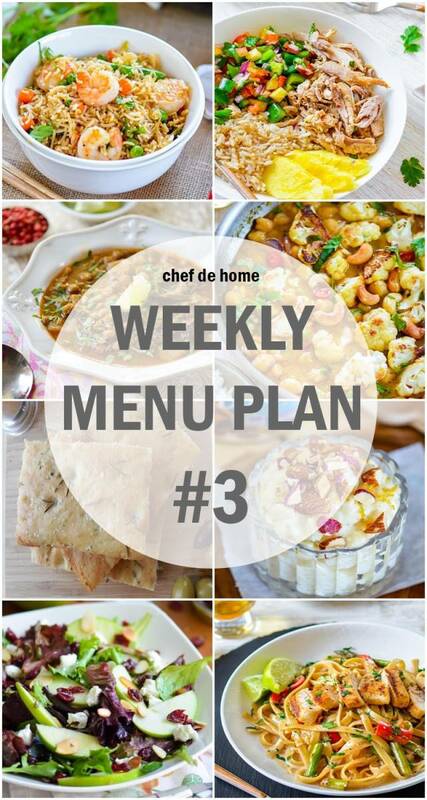 And so is this week's weekly meal menu plan. This week's menu plan has theme - Healthy and Fit. Every recipe in this plan is carefully selected keeping healthy eating in mind. The week starts with meatless and vegan Monday dinner. Following day's recipes are easier with one-pan cooking options and healthier with lots of fish and minimal use of oil. To keep weekend interesting, meal also includes a homemade bread and a scrumptious (no egg and no butter) Rice Pudding for dessert. I hope you all will enjoy! Wish you wonderful weekend. Don't forget to pin the menu for referencing later. 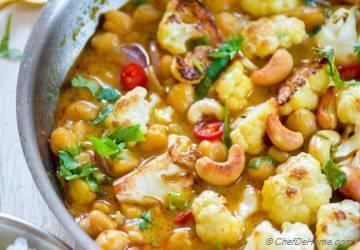 Monday - Start week healthy with vegetarian, vegan, meatless Chickpea and Cauliflower Curry. Easy to cook and perfect to make-ahead. 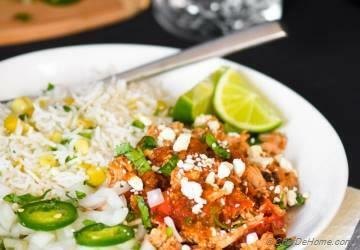 Tuesday - Taco night gets spice and warmth with this no-oil Mexican Chicken Tinga. Ready in slow cooker and perfect to save some for sandwich/rice bowl on Thursday. 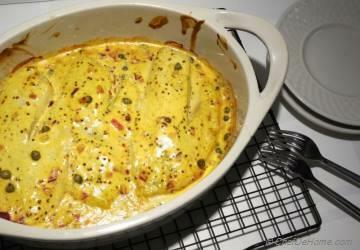 Wednesday - Bake Tilapia with tangy mustard sauce makes an excellent light and healthy dinner. You can serve a fall-inspired apple salad on the side (recipe suggestion below). Thursday - the best way to eat healthier? Include some salads in your dinner menu. 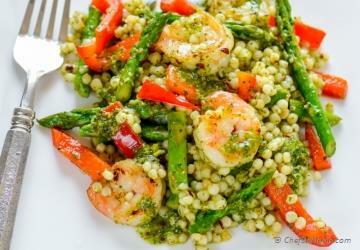 For this Shrimp and Couscous salad, pan-sear shrimp while couscous cooks. Just add dressing and dinner is ready. Friday - Fall/winters call for some comforting dinners. 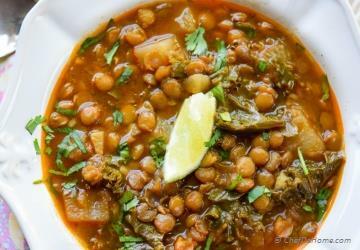 If you are dinning-in for Friday, a healthy kale, turnip, and lentils soup will bring whole grains and greens on dinner table. Saturday - Let's bring some Asian meal to dinner table! 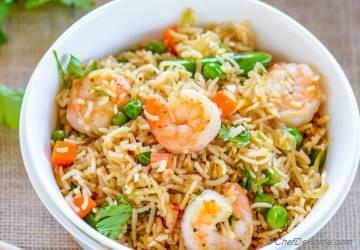 How about some Shrimp Fried Rice! Smart Swap tip: Replace rice with cooked quinoa! 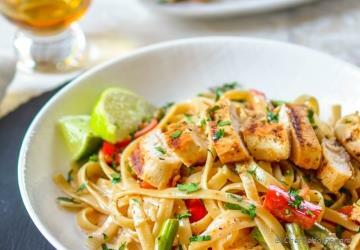 Sunday - After full week's healthy choices... Sunday deserves a comforting meal! Don't you think? 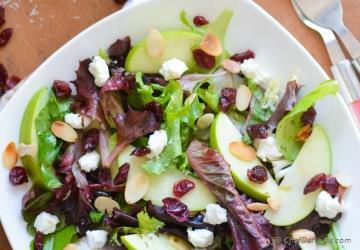 Fall Season calls for a seasonal Apple salad. How about Apple and Goat Cheese salad to serve on side with Wednesday's dinner!? 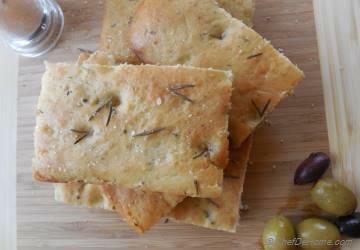 Bread - Homemade bread is perfect compliment to a homemade meal. Bake one extra, portion and freeze to accompany all weekday meals. 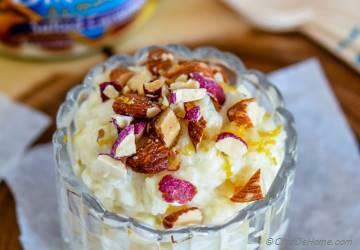 Dessert - A sweet treat that everyone will love!